Temple University Press, 9781439914366, 320pp. 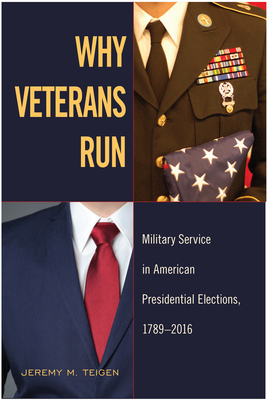 In Why Veterans Run, Jeremy Teigenexplains the tendency of parties to elevate those with armed forces experience to run for high office. He describes the veteran candidate phenomenon by examining the related factors and patterns, showing why different eras have more former generals running and why the number of veterans in election cycles varies. With both quantitative and qualitative analysis, Why Veterans Run investigates each postwar era in U.S. electoral history and elaborates why so many veterans run for office. Teigen also reveals how election outcomes with veteran candidates illuminate the relationship between the military and civilian spheres as well as the preferences of the American electorate. Jeremy M. Teigen is Professor of Political Science at Ramapo College.